Rajasthan is no doubt one of the most popular tourist destinations in India. The main reason for this is the rich cultural and traditional heritage which the State showcases with much pride. The Bishnoi Village located at a distance of 22 kilometers from Jodhpur offers one an amazing insight into the life of the villagers who worship nature and still preserve their ancestral ways. The villagers of Bishnoi are particular in protecting their nature and worship Lord Vishnu. The people preserve nature so much that they do not burn the blue colored cloths as a large amount of shrubs has to be cut down to give the color. The village has a Lake called the Guda Bishnoi Lake which gives a serene atmosphere and a perfect location to locate a variety of birds including the Blackbucks. A perfect example of village lifestyle can be experienced here through the Shepherds and the Weavers in the village. Also Bishnoi is a place where Opium can be legally grown. Rajput palace, Incredible Krishna cooking Workshop and the Umaid Bhawan palace. October to March is a perfect time to visit the village. By air :The nearest International airport is located at Udaipur. By train : The nearest train facility is Salawas which is at 11 kilometers distance from Bishnoi village. 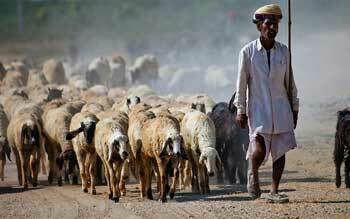 By road : Bishnoi village is located on the route to Udaipur to Jodhpur. It can be reached form Jodhpur on road through bus or taxi.